It’s finally feeling like summertime here in Sacramento. The kids are enjoying the freedoms of Summer Vacation, we are seeing rapidly rising temperatures, and everyone seems have the beach on their mind. While for the majority of us in Sacramento, nothing sounds nicer than heading to the coast for a little rest and relaxation, Jim Denevan prefers to use the surf and the sand as his canvas upon which he creates startlingly beautiful earthworks that seem to defy reality. Earthwork art is an art movement in which the natural landscape and the piece itself cannot be separated from one another, and natural elements are used as the canvas themselves. Rather than creating a sculpture and placing it into a natural setting, the landscape itself becomes crucial to the piece. 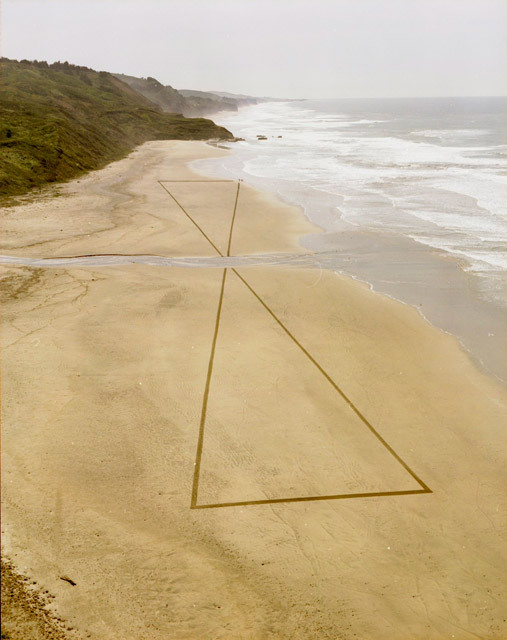 Earthwork, also known as land or earth art, began in the United States as an artistic protest against economic destruction in the 1960s. These people rejected the common conceptions of art; not only by disassociating art from the museum in which it normally resides, but by creating works that were vulnerable to the tests of time. 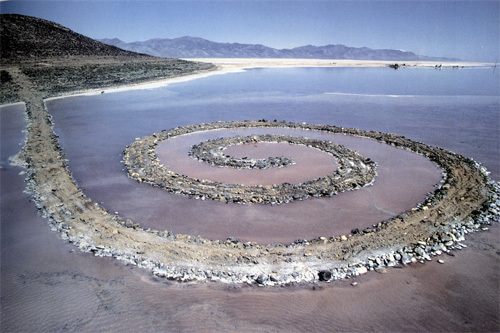 One of the most influential artists of the movement, Robert Smithson, who coined the term “earthwork,” is famous for his piece, Spiral Jetty, which still resides in the Salt flats of Salt Lake City. 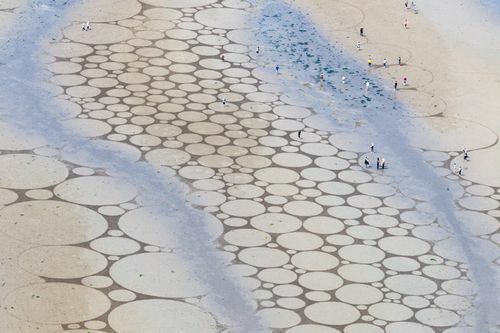 This piece is constructed of piles of gravel, mud, and salt crystals. How much the jetty shows depends on the natural flux of the earth. Smithson refuses to alter the natural decay of the earth, and of the piece. Similarly, Jim Denevan, a Santa Cruz resident, heads to our great state’s beaches armed with nothing more than a rake and a stick. 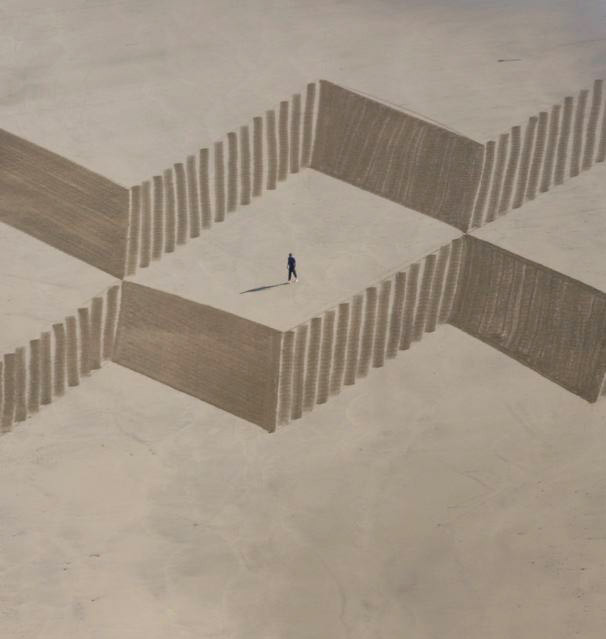 He creates an entirely unique, and short-lasting type of art that’s monumental size can only be fully appreciated from above. He uses unforgiving geometric shapes, that not only vouch for the precision and delicacy of his craft, but also create almost startling juxtapositions with the natural landscape. The temporary and fleeting nature of Denevan’s works add to their beauty. While they cannot be featured in a museum of modern art of on a wall, the ingenuity of Jim Denevan’s work, and the work of those like him, will live on in the form of inspiration to other aspiring artists, looking to change our perceptions of the relationship between art and nature.